La Parrilla was opened for the public in October 2016 in the building of IBEROSTAR, but runs independently of the hotel. The restaurant can hold 60 people, and in the summer it is further enlarged by a spacious terracce facing the Liberty Square. It inherited its interior from its ancestors, La Plaza and Borkakas. The inner decoration of red, beige and black colours resembling the Latin temperament and gentle elegance at the same time was created by a Spanish interior designer. However, the elegant exterior does not indicate an uneasy atmosphere or formalities. Mediterranean people consider food as a huge and delightful part of their lives; not as an experience they gain and can tell stories about afterwards, but rather as something that pleases them, like music, a passionate night, or sunbathing in the afternoon on the sea shore. Eat, drink and be happy – people say in the South, and that is the motto of the new Mediterranean restaurant, the La Parrilla that opened where the former Borkakas could be found. La Parrilla welcomes the awakening city with open arms from 7am and you can start the day with a substantial gourmet breakfast – even with a steak – until 11am. In addition to a’la carte meals, a three-course meal for lunch being renewed every week, the Time for Lunch widens the wide variety of food. 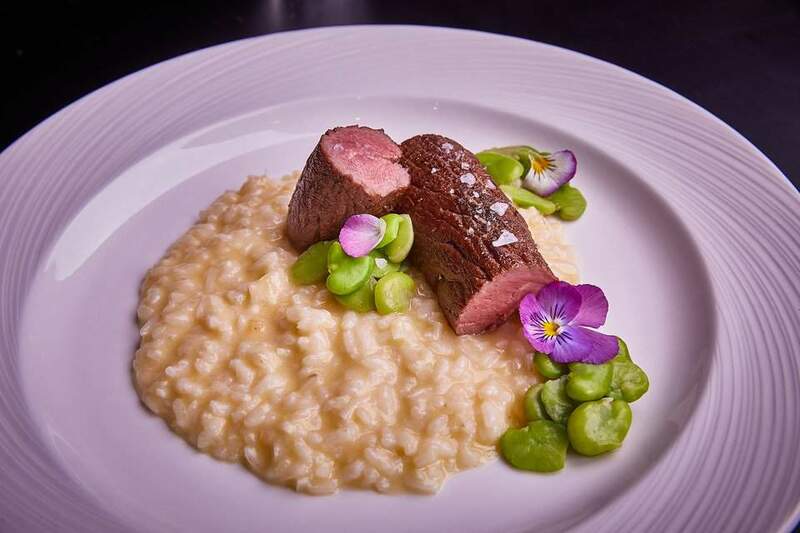 The special variety of meals and the high-standard execution are the merit of the chefs, Péter Szabó and Balázs Papp. Péter coming back from abroad met Balázs in a restaurant in Budapest last year – the professional agreement, the common currency and the mutual sympathy took shape at first glance, so it only was a question of time until they began to work together. The cuisine of La Parrilla is typically Mediterranean, risottos, pastas and salads can be found on the menu. Dishes grilled on hot stone and Omaha Filet Mignon are outstanding and although they are really good with meat, vegetarians can also find dishes to their liking. 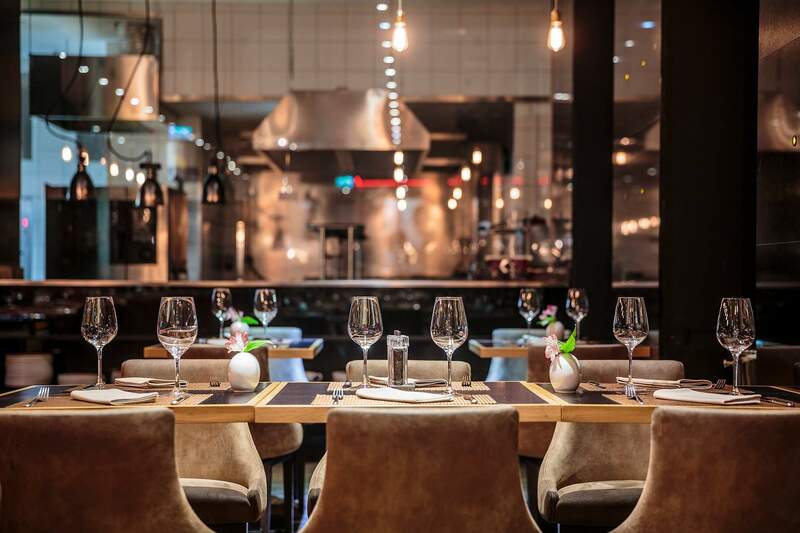 In addition to the emphatic Mediterranean line, the Hungarian cuisine and the home materials are also present in, for example, the foie gras or the mangalica dishes. The supply of desserts is quite impressive as well. Green asparagus salad: fresh slices of green asparagus and asparagus cream with fried soft-boiled egg and olive oil. The olive oil provides a character of almond and butter with some taste of apple. Gentle Spannish olive oil with a hint of pepper but without bitterness. When cutting the soft-boiled egg, its yolk running out provides a wonderful taste with the dressing. 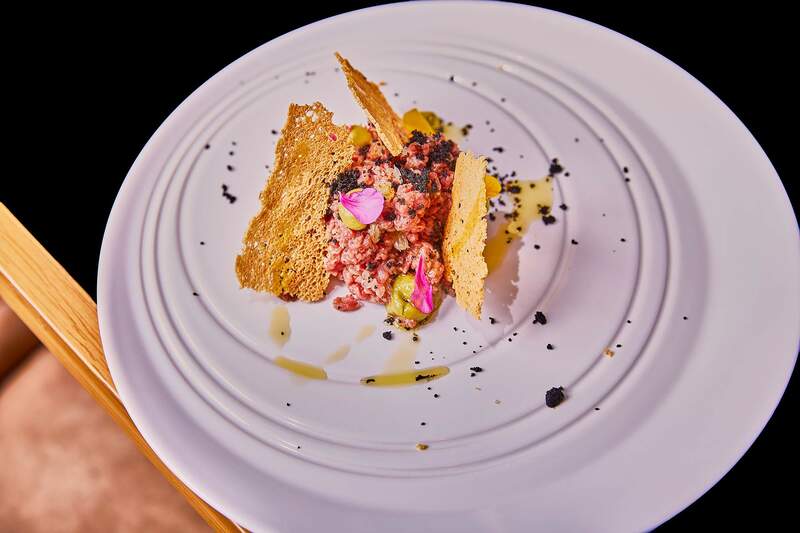 Mediterranean steak tartare: a simple steak tartare made of beef which becomes Mediterranean by the Mediterranean ingredients – it is prepared with dried capre, fibres of lime, maldon salt and guacamole. The avocado is hass avocado which is one of the highest quality avocados of Mexico, its characteristic feature is its rough rather than smooth surface. Its acidity can be thanked to the lime, while its unique taste can be thanked to the capre and the black olive powder covering the dish. 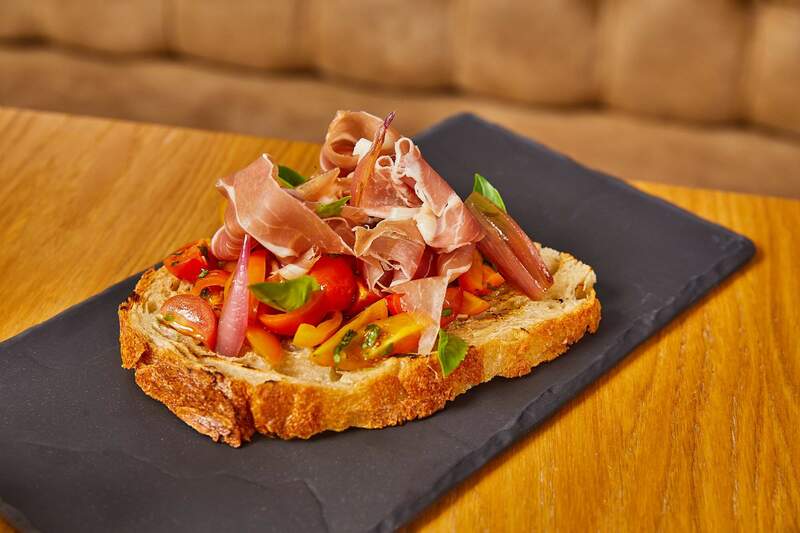 Bruschetta: home-made bread with cherry tomatos in two colours, basil, olive oil, soured shallott and slices of ripened prosciutto. Tagliatelle with Toscan wild boar ragout: home-made pasta made of Italian flour and wild boar ragout with rosemary, with a slight layer of pecorino cheese on top. Parmigiana: the vegetarian version of the traditional Sicilian aubergine-tomato-cheese dish (the original, ancient parmigiana is made of meat). The aubergine, tomato, parmesan and mozarella cheese are layered slightly on top of each other in the pot, then in the oven. Fish cream soup: clear soup with sea fish condensed with polenta, served with grilled shrimps. The basic soup is made of fishbone: orada, branzino, etc. Dessert of white chocolate, passion fruit and pecan: praline served with maracuja granita and seasoned white chocolate mousse. Chocolate tart with cherry: tart of almond flour with cherry jelly and dark chocolate cream. The chocolate flavoured with red fruits is French Valrhona dark chocolate. The Valhrona chocolates are made in a small French village for about 100 years – due to their high quality and complex but balanced taste they are regarded as one of the best chocolates of the world. 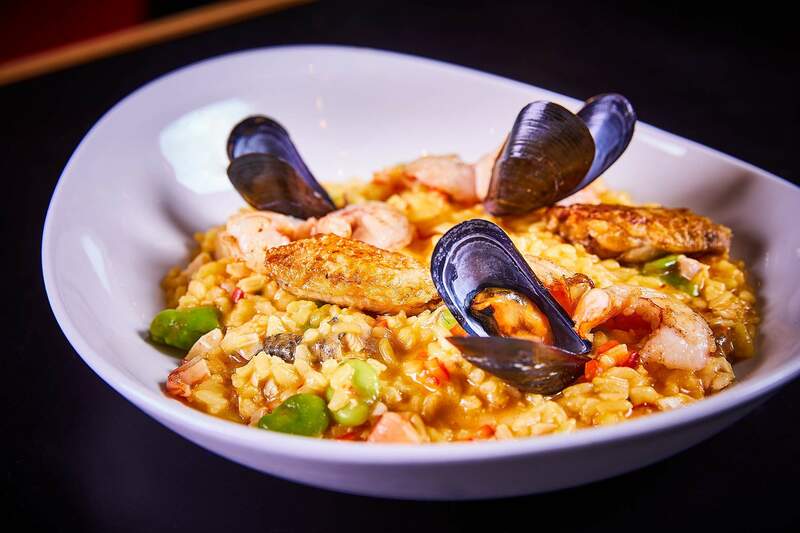 Paella: Spanish national dish, rice coloured with saffron served with sea fish, shellfish and vegetables. Nearly 100 Hungarian and international wines can be found on the wine list of La Parrilla. We can taste Spanish Rioja, Toscan red wines, French Chablis or the Sauvinon Blanc of New-Zealand, and the list could go on.